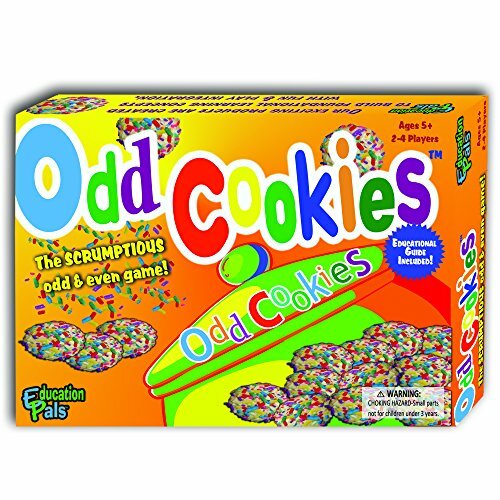 Education Pals™ Odd Cookies™ - Cool odd & Even Math Learning Board Game. - Top Educational Play for Boys & Girls. - Perfect for Kids & Entire Family. - Best Gift for School Students. •Educational guide included.The exciting yellow cookie bag will keep your game cool, & it will help keep the playing area organized & ready to play.2-4 players. The game duration is approx. 10 – 18 minutes.The materials are durable, high-quality material crafted to play & play, yet last a lifetime as well.The game will develop & strengthen logical-mathematical skills, emotional intelligence, sharing & cooperation, eye & hand coordination & right & left brain integration.Kid friendly designed & created; for the joy of our young students at the early math stage. The scrumptious yummy sprinkle cookies that your child loves will connect their brain to the educational benefits of the game.Playing the game: Each player receives 1 odd & 1 even cookie jar board. Players take turns rolling the 10-sided die. They take the corresponding amount of cookies & place them on their correct boards. Be the first one to fill your cookie jar boards with the delicious sprinkle cookies, & you are the lucky winner!The instructions are simple to read, fun & easy to master.It’s perfect for parent & child play, exciting for kids, fun for everyone.